OK! This is only in part about jewelry… I am writing from Doha in Qatar. I am here on business for my 3rd annual trip. But this time I got to visit the newly opened Museum of Islamic Art. It is a majestic structure on the Corniche (bay) of Doha built by IM Pei, arguably the most noted present day architect of museums, having designed the East Wing of the National Gallery of Art in Washington DC, the pyramid structure of the Louvre in Paris, and the Miho Museum in Japan. Seen from certain angles the museum in Doha looks like a veiled woman. There are many breathtaking vistas of Doha from the Museum. The Museum of Islamic Art covers a lot: 7th to 19th century art and artifacts including textiles, metalwork, scientific and astronomic instruments, architectural design, carpets, paintings, lots of calligraphy, glass and ivory objects, and jewelry! The latter is why I went in the first place, of course. The museum is a “must see”. A monster necklace belonging to the Indian 17th century Mughal emperors Jahangir and Shah Jahan sporting one inch pink spinels (some of which are engraved with the emperors names), diamonds, pearls and gold. Emeralds and huge diamonds on this necklace. A haldili of Shah Jahan. This is a calligraphic jade pendant worn to cure the wearer of heart palpitations. The emperor wore this to help him recover from grief after the death of his beloved wife Mumtaz Mahal in 1631. Unbelievable paired gold filigree bracelets, worn on both wrists during the Fatimid period in Egypt/Syria from the 11th century. Similar ones are depicted here. 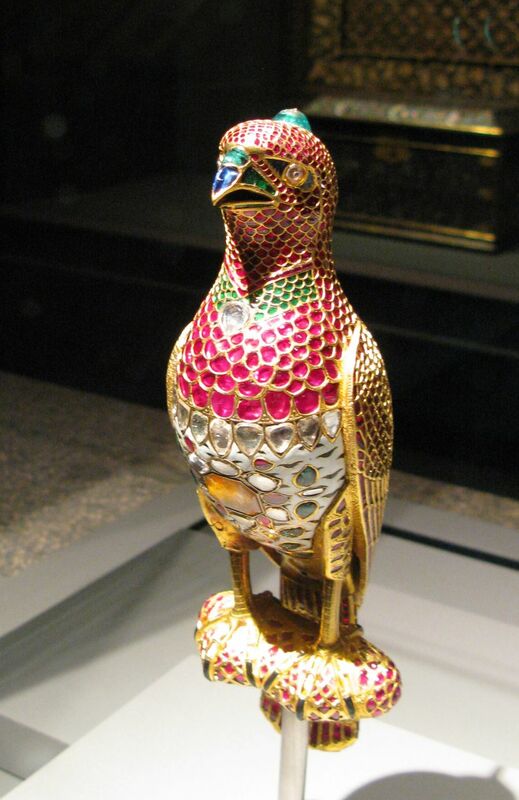 And, my favorite, the Jeweled Falcon, also from Shah Jahan, and dated 1640. This 10 inch bird is completely covered with gold, enamel, inlaid rubies, diamonds, emeralds, sapphires and onyx! This museum is well worth a visit, even a detour, to Doha if you are in this area of the world. On my way home, I decided to walk. It was 5:30 PM and the hotel was on the other side of the Corniche. I guessed, maybe 4 miles away and about 1 hour at a brisk pace? There was lightening in the distance and the sky looked ominous. Would I get drenched? 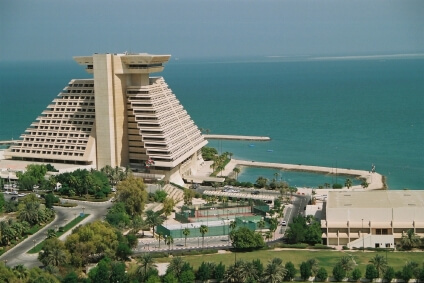 The Corniche is bordered by park grounds, and this is where people spend their time off, along the water. It is a great walk to observe people. Doha is such a clash of cultures, I thought. There is the traditional, the veiled women in a black abaya and/or hijab, men in white thobes with a white or red checkered ghutra covering the head, mosques everywhere in the background. And there are the young people who wear jeans and tee shirts with English words on them. One such shirt read: “Everybody wants to be just like me!” I smiled at the young man and he smiled back. One young woman was sitting on a bench, completely veiled in black abaya, but she was wearing hot pink high-healed shoes! On the water there were young men on jets skis going at top speed perilously close to the rocky shore, or doing flips in the air and crashing in to the water to the applause from the walkway! Then there were joggers, perhaps a dozen: all men, except for one woman in a sports bra. This is just like Central Park, in New York, I thought. These joggers were likely not Qataris. I think they were what are called “guest workers” or “ex-pats”. For every Qatari, there are about 5 or 6 guest workers in this country. Many have menial jobs maintaining the hotels or building the high rises under construction everywhere. They come from the different countries lining the Indian ocean. 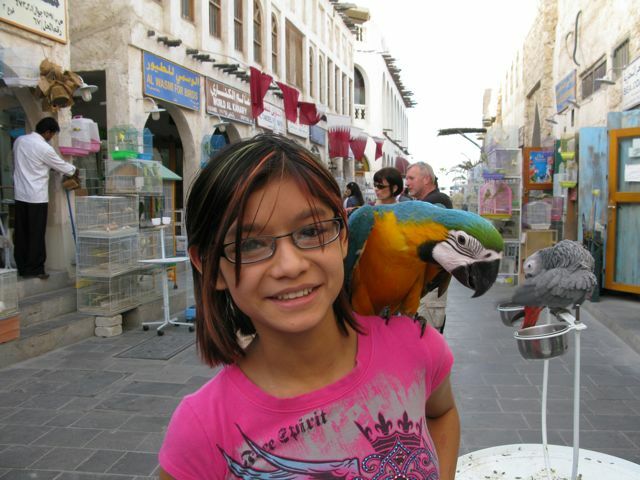 There has been concern about how they are treated, for example in neighboring Dubai. Others are from Europe or the United States. There are major international companies with a large presence in Qatar, such as the French oil and gas company Total. I had previously met some French people working in Doha for Total. I passed the Emirs’ palace, a government building. Then there is a 36 foot clam shell with a pearl in it, a well know landmark sculpture in town. I passed Balhambra, a local restaurant on the water, and the large statue of Orry the Oryx, a Qatari version of a Disney character it seemed to me. I passed enormous billboards for QNB (Qatar National Bank) offering mortgage loans to young Qatari couples! Behind the billboards, one high-rise under construction after the other. I tried to remember the name of the construction companies: Al Jaber was one of them. I passed a new high rise called Al Bidda: a twisted triangular structure, not much to my liking. Finally, I passed through a lovely large meadow with a playground, swings, sand, lots of kids chasing balls, or one another. In the shadows of the park there was even a couple being affectionate, but as I approached they shrank away from one another. Then a long row of flowering white Rhododendron plants leading up to the pyramid structure of the Sheraton hotel. This entry was posted in Jewelry and tagged art museum, islamic art, Jewelry, precious metals. Bookmark the permalink. 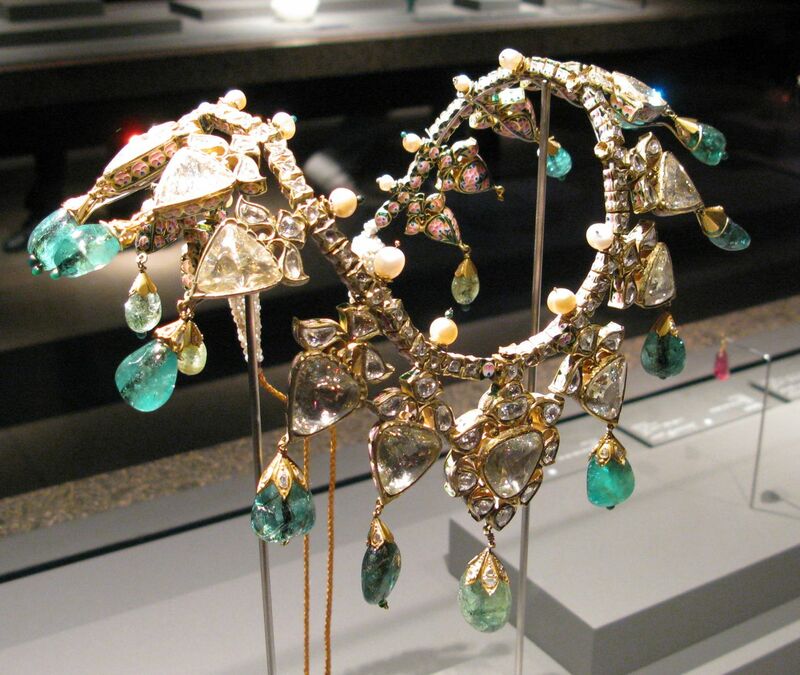 Jewelry, throughout the rich history and even before Islam, has played a pivotal role in distinguishing social classes. Earlier rulers of different dynasty and elite class loved to demonstrate their wealth and power by wearing elaborate jewelry lined with precious stones and intricate designs. However, earlier these jewelry pieces were heavy and adorned all the times.